Bioremediation is a waste management technique that involves the use of natural organisms to neutralise pollutants from a contaminated site. PAG offers membranes and covers for bioremediation in biopiles and windrows. They are high strength, low cost, exclusion materials for Biopile/Windrow isolation. we also offer cover materials to improve the process performance. We are also pleased to have introduced the first degradable lining material through our association with Canadian manufacturer EPI. Bioremediation may occur on its own (natural attenuation or intrinsic bioremediation) or through the addition of stimulators, oxygen, etc. that help to enhance growth of pollution-eating microbes within the medium (biostimulation). Ex situ bioremediation is a technique widely used for site cleanup and consists of excavating contaminated soils and placing them in heap (biopile) or long rows (windrows). Basal liners & various covers. 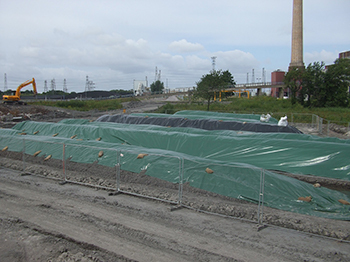 In order to protect the ground from leaching of contaminants from bioremediation a geotechnical barrier is required. PAGeoTechnical has developed a range of specialist materials especially suited to the applications of the bioremediation sector. Wide rolls available for self-installation. Single sized panels available up to 1000m2. Site installation available for larger areas. A specialist coated HDPE woven fabric with LDPE coating offering high strength and tear resistance at low cost for single use applications. Rhinomat® is a thick polyethylene reinforced composite geomembrane specifically designed for use in water retention and containment applications. A geomembrane quality (meets all current CEN application standards) polyester-reinforced LDPE membrane for high risk applications such as locations on or near ground water reserves . A range of brightly coloured (orange) alert layers textiles nets and membranes for use in bioremediation. Bioremediation processes require specific atmospheric conditions for optimal performance. PAGeoTechnical are pleased to work with bioremediation specialists to develop and provide products to produce optimal conditions for individual site and process conditions. Fleece covers designed for dust suppression and to allow water ingress. Micro-perforated covers to prevent most water ingress but still allow biopile to breath. 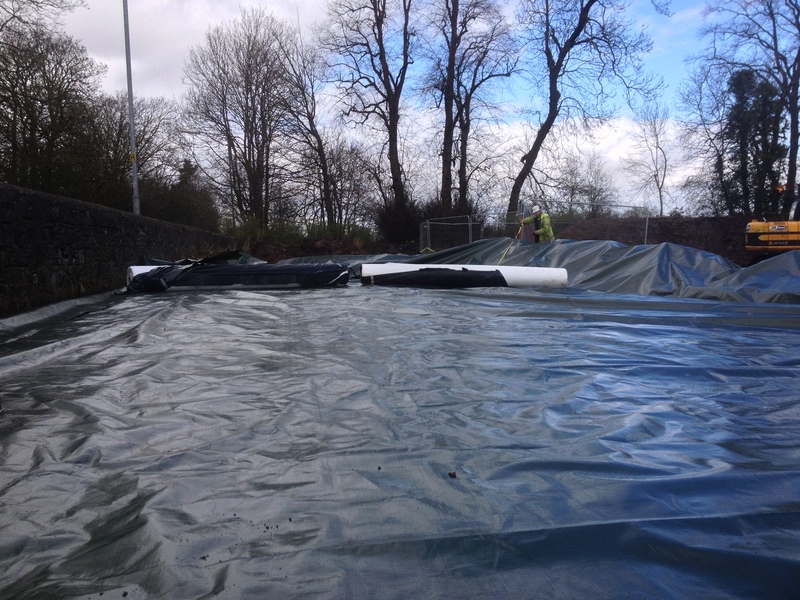 Impermeable covers for complete containment. Bioremediation is an ever-moving area and processes are constantly being developed and refined. If you wish to discuss a particular material requirement please contact us. We may be able to supply something appropriate from our extensive knowledge of international manufacturers or have a bespoke product made to your specification. Lightweight coated fabric for impermeable cover of biopiles/windrows. Perforated coated fabric to offer breathable cover for bioplies.